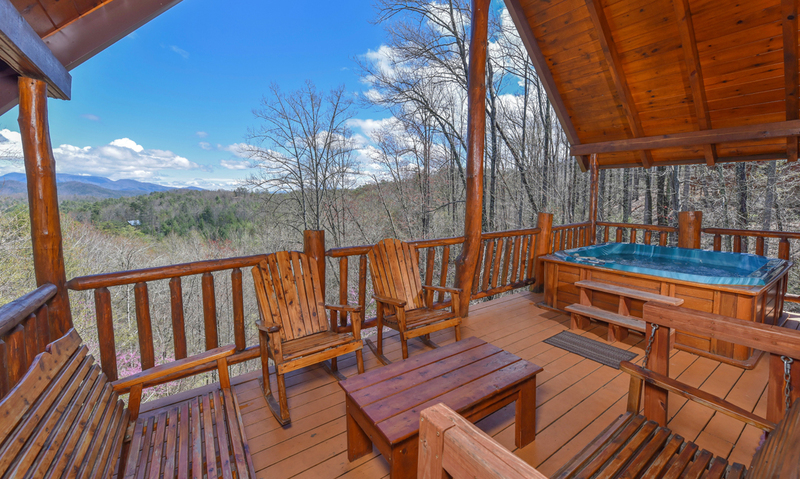 Perched high atop the mountains of Pigeon Forge, this 2-bedroom plus loft, 3 1/2 bathroom real log cabin offers truly stunning views. 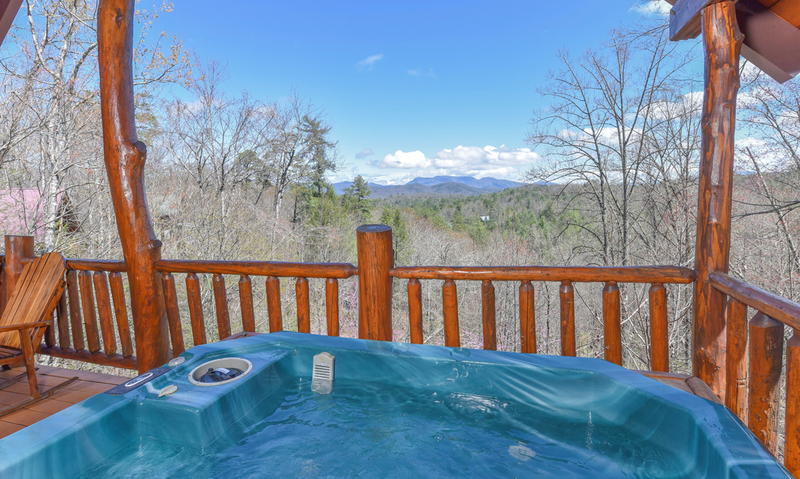 Gaze out at the blue-mountain view as you soak in the hot tub or relax in the rocking chairs in the privacy provided by the one-acre lot. 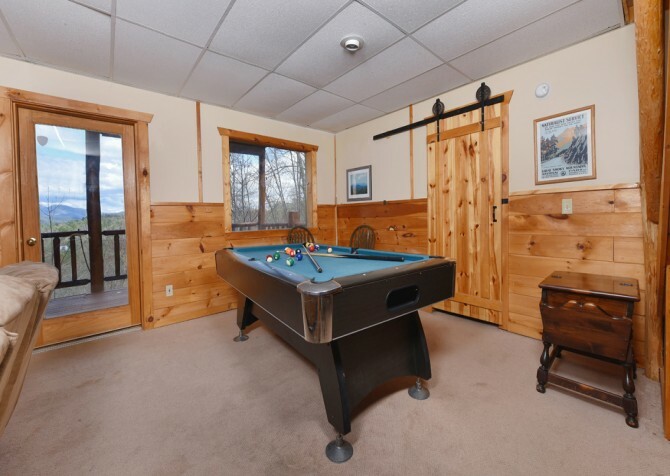 Then head inside to curl up on the sofa in front of the big screen TV, play pool and chill at the wet bar in the rec room, cook family meals in the fully equipped kitchen, or get some much-needed rest in one of the three comfortable bedrooms. 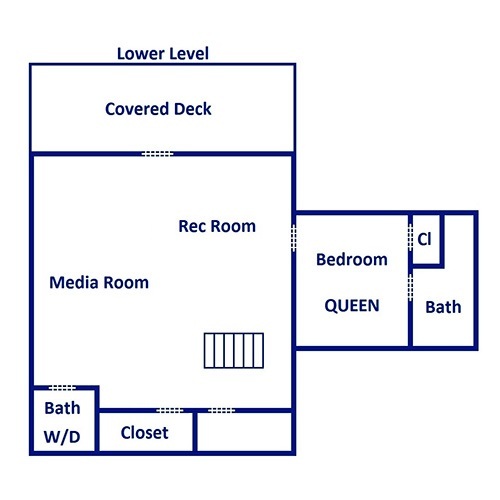 With room for 10 guests, Moondance is outfitted and sized just right for a family or several couples! The main living area of Moondance offers an open layout, allowing guests to flow freely between the living room, kitchen, and dining area. 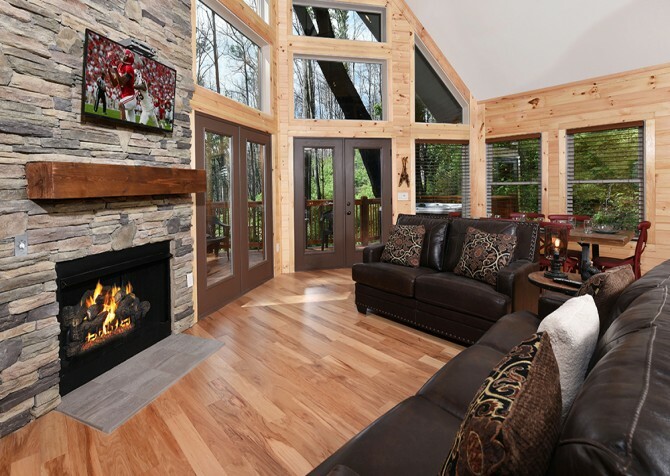 The vaulted ceilings make the space feel large and open, and the furnishings and warm wood interiors keep it cozy and warm. Whether it's too hot, too cold, or too rainy outside, you'll always find a comfy spot in this homey living room. A beautiful brown leather sofa and soft chair sit in front of a flat screen TV mounted on the wall. 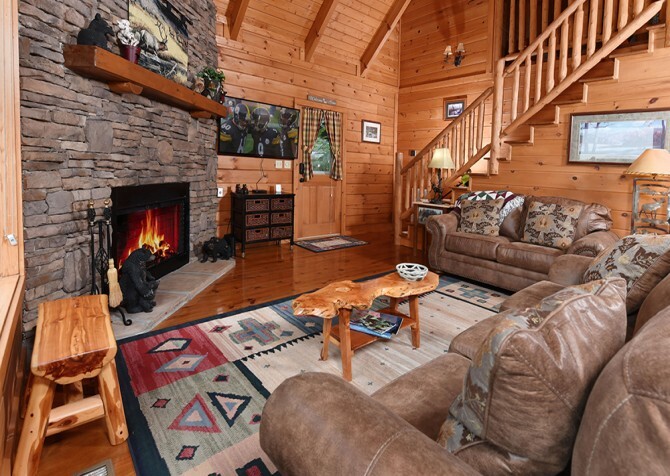 Stained glass, vintage décor, and Smoky Mountain art add a touch of charm. 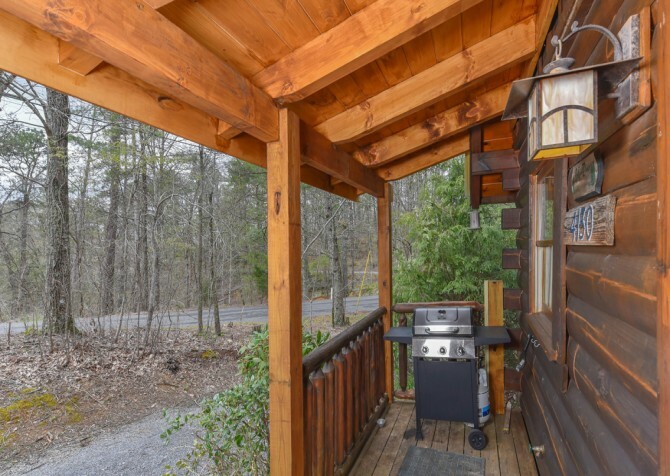 When you just want to relax inside, curl up in front of the gas fireplace or kick back with a good book and enjoy the peacefulness of the mountains. 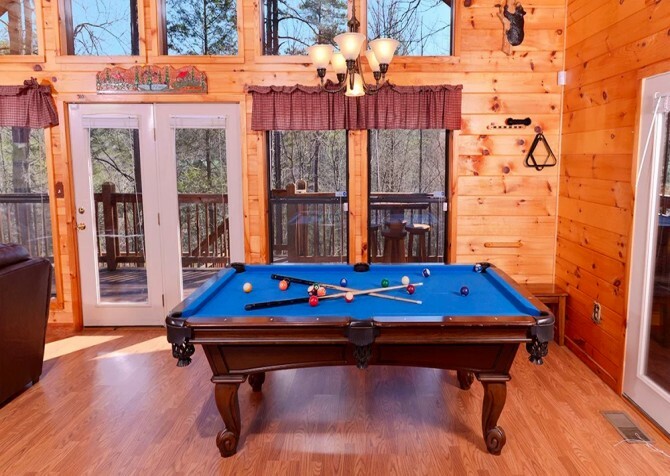 You can keep snacks and drinks on the coffee table or use it to play card games on lazy afternoons around the cabin. The dining area of Moondance is conveniently located between the kitchen and main living room. 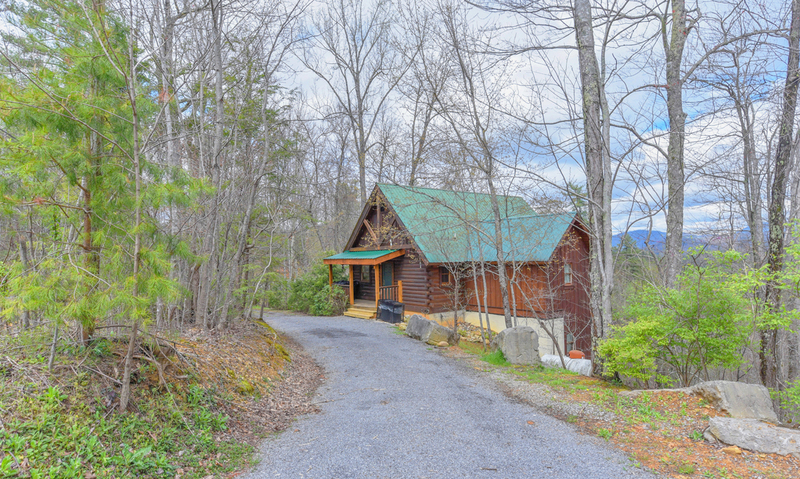 It's ideal for families and groups who want to visit while cooking, eating, and watching TV. Guests can spread out as they wish and still enjoy each other's company. 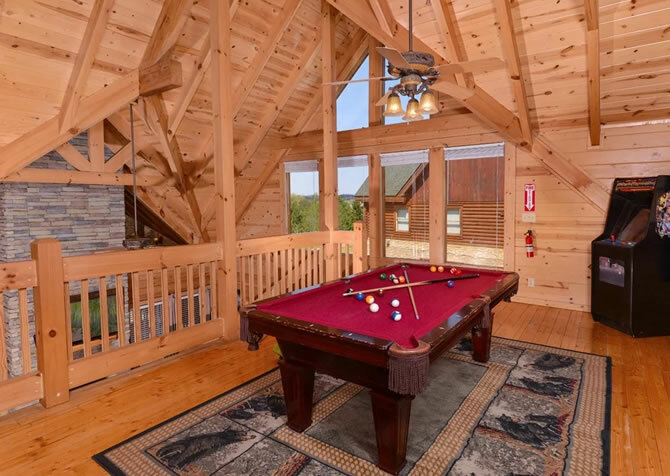 Sitting underneath a rustic antler chandelier, the hand-built dining table – a blend of black and natural wood – is spacious enough for everyone staying in the cabin. It offers a mix of bench and traditional chair seating, giving the area an eclectic look. Two large windows at the end of the table frame the picturesque view. As you dine, take in the beauty that surrounds you and enjoy a view you wouldn't find at any restaurant downtown! With enough entertainment to keep you in the cabin for days, the rec room of Moondance is comfortable and fun. A big, comfy couch and plush chairs surround the big screen TV with satellite and a DVD player. 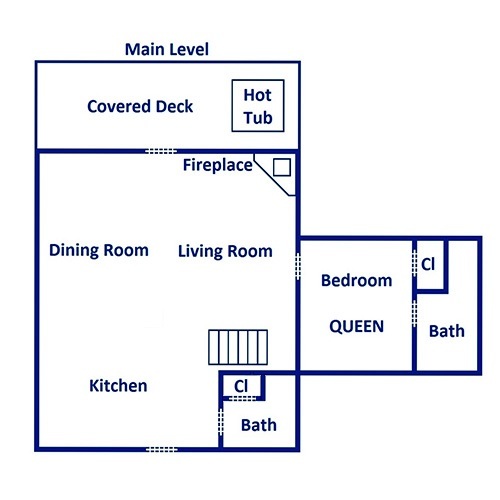 The wet bar is a great place to hang out with a convenient refrigerator and microwave. Not to be outdone by the main living area, this room also boasts some beautiful views of the Smoky Mountains, which you can enjoy as you watch TV, recline on the sofas, or play games. You can play board games or card games on the coffee table in front of the sofa, or you can head to the other side of the room to play pool and foosball. 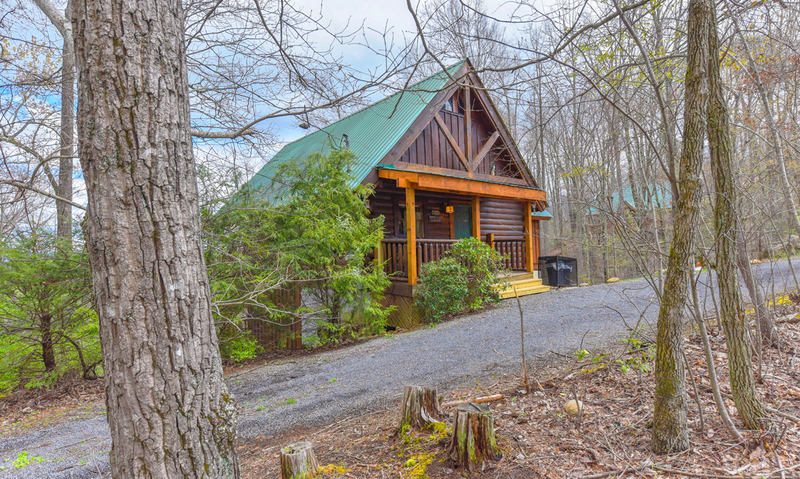 Rustic style meets modern amenities here, with a sliding barn door and gorgeous tree trunk columns. This room also provides easy access to the lower deck when you need some fresh air. 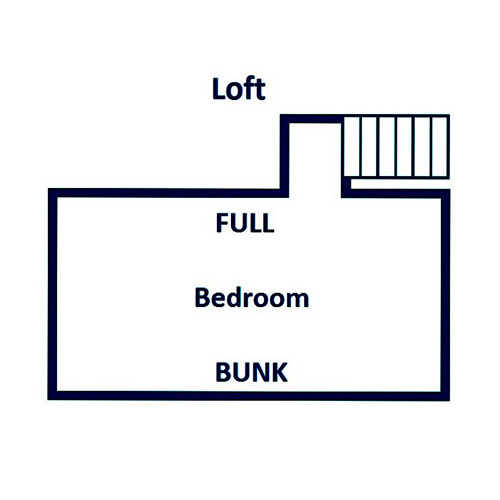 Each of the bedrooms, including the open-air loft, in Moondance provides a peaceful place for guests to rest. They all feature unique décor and comfortable and tasteful bedding. One bedroom, furnished with a queen bed, has a beautiful log feature wall, stained glass window, and two large windows that showcase a gorgeous view of the mountains. A dresser by the bed has a lamp, room to unpack, and space to keep phones, glasses, and other necessities nearby. 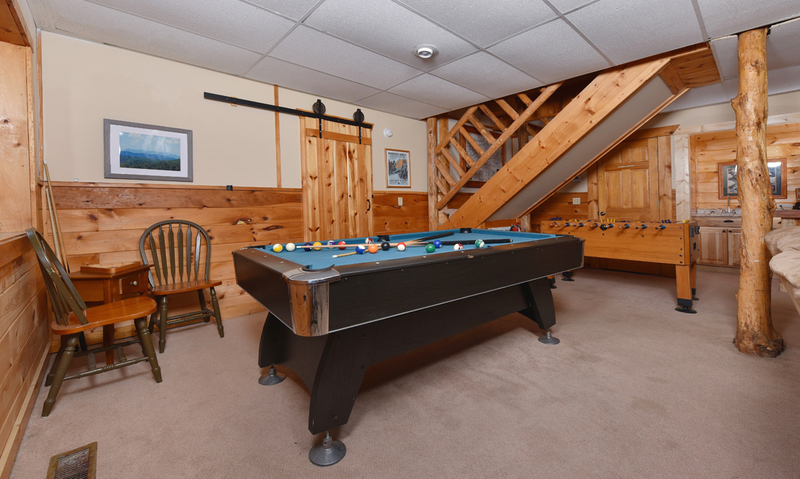 Upstairs, a bedroom in the loft area is great for kids or families. It is furnished with a full-size bed and a twin bunk bed that kids will love. Each bunk has its own light, so kids can read at night in their own little space. This room also has a small sitting area with a lamp and small dresser. In the other bedroom, a queen-size bed has a lovely red and cream bedding set and a big mirror over the headboard. Guests can unpack in the large chest of drawers and take advantage of the private bath here. You'll also have wooded views from bed, so you can let the sunlight slowly wake you in the mornings. This cabin also offers a futon in the lower level. There is plenty of outdoor space to enjoy at Moondance, with multiple levels of decks overlooking the fantastic Smoky Mountain views. 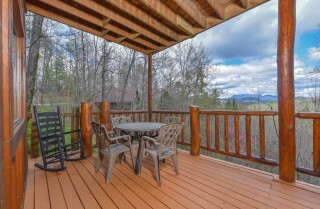 On the lower level, sit down for meals on nice days at the patio table for four. It's a great spot for enjoying a peaceful lunch or having a snack between games of pool. 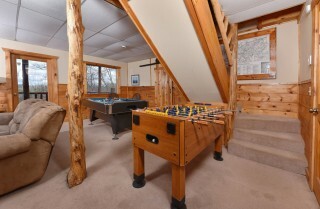 There is also plenty of space for guests to walk around and stretch their legs after a movie marathon in the rec room. On the upper level, find plenty of seating and a hot tub that will allow you to really relax at night. 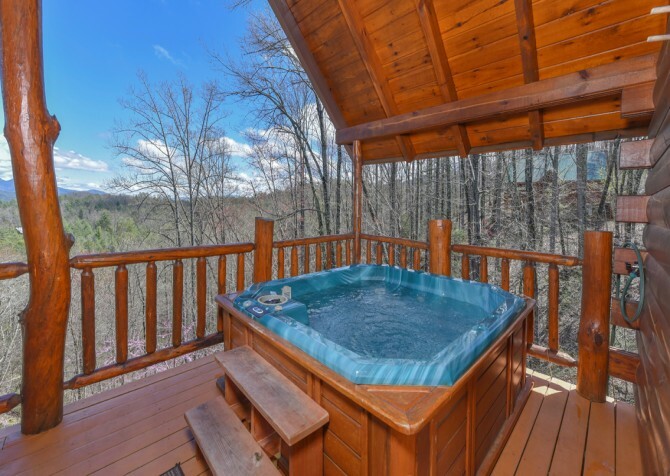 Tired muscles will appreciate the bubbling waters of the hot tub, and tired feet will appreciate resting in the rocking chairs after a long day. 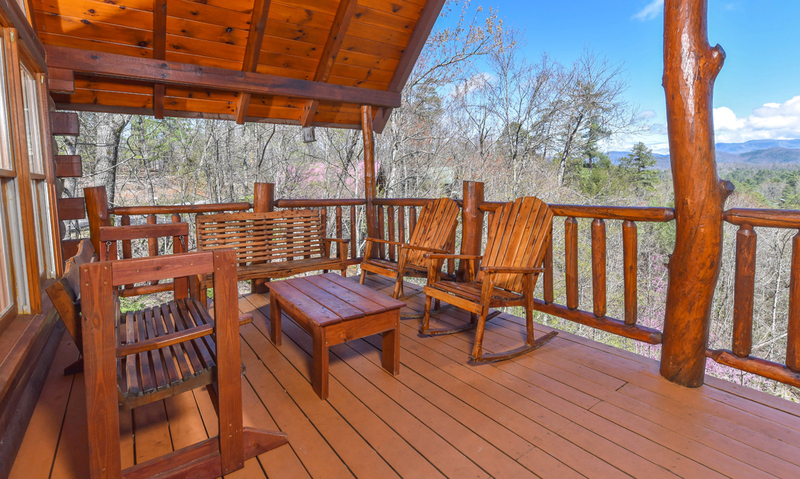 Sit back, have a glass of wine, and breathe in the fresh mountain air. 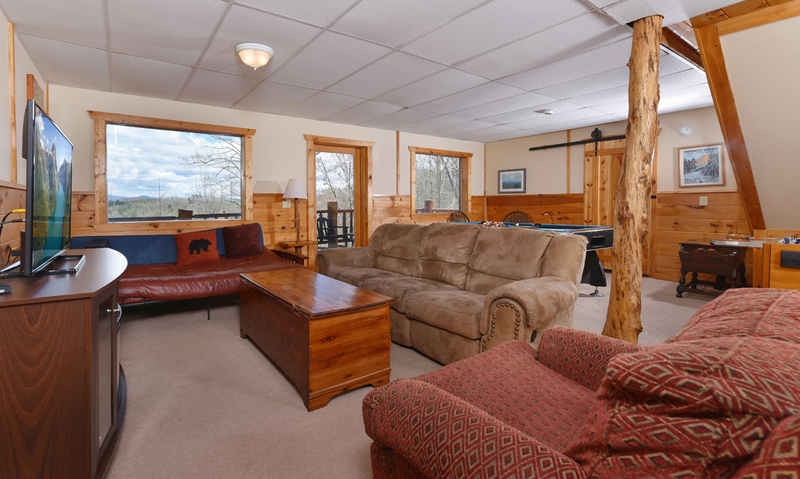 There is even a small coffee table here, so you'll have a convenient place to lay out a spread of snacks or keep drinks. At the front of the cabin, fire up the gas grill on the covered front porch for a cookout you can enjoy with mountain views. 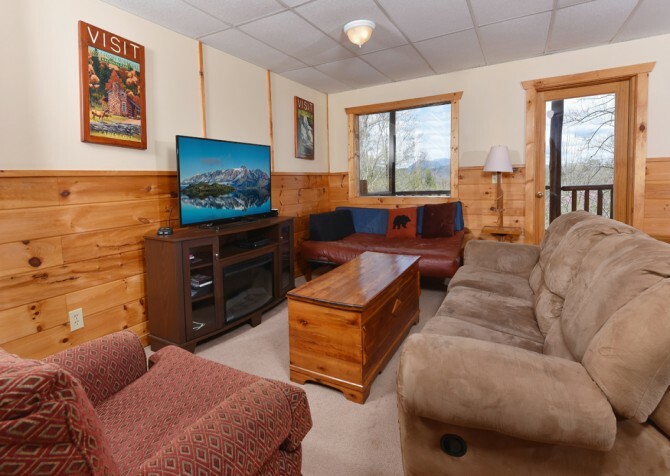 Moondance is furnished with lots of great amenities to keep you comfortable. In addition to the games and cozy spaces, this Pigeon Forge cabin offers a washer and dryer and an iron and ironing board. Both are great for longer stays – just pack light and do a load of laundry while you're around the cabin. In the Great Smoky Arts & Crafts Community, Jim Gray Gallery features sculptures, watercolor, oil paintings, giclee, and more. Charming and unique, it's located inside a 100-year-old former church building. 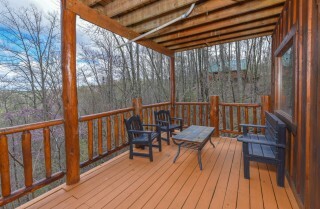 Go zip lining and mountain biking at this exciting attraction in the Smoky Mountains. The bike trails are like nothing you've seen, with wooden tracks winding high above the trees. The only musical comedy entertainment in Gatlinburg, Sweet Fanny Adams is a hilarious time for the family. Mix audience participation with talented performers, and you get a great night out with lots of laughs. "Just finished a weekend in Moondance Cabin. Have no complaints everything was great, view was beautiful had no issues with cabin and very clean! Will be back again hopefully with a bigger group. 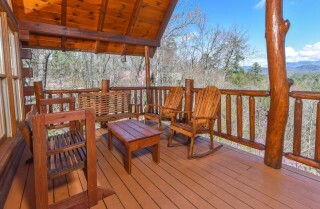 Tennessee is a beautiful state!" "We rented the Moondance cabin through Cabins for You, everything was great the cabin was cleaned and had great views. The representative for cabins for you were very polite very helpful with suggestions for things to do. 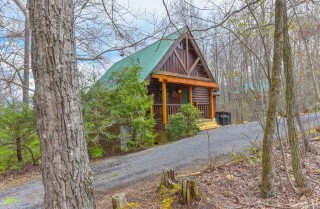 We definitely will be using Cabins for You again."